This is a tutorial on how to make a USB token (25dd:2621 / 25dd:2611) work on linux, theres no linux driver provided to Chileans using this specific token, so i would like to share my findings on how to make it work. Its very sad that our government is using companies known for handle user data and foreign spy agencies like M******t, insecure by design and of course closed source, no linux/open driver is given to the citizens for this token. But lets fight the right cause (we shouldn’t be forced to buy w*****s in order to accomplish our basic taxes operations). 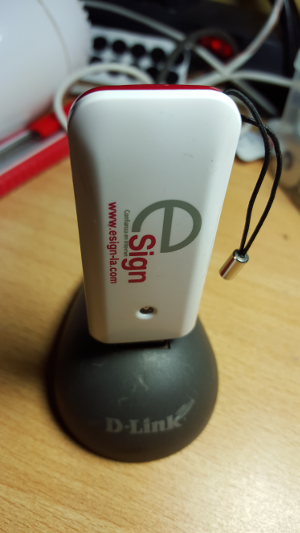 STEP ONE: Initializing the USB Token with usb_modeswitch. I had to snoop the usb connection in order to see how the usb token was initialized, lets see the usb communication (altho its not a full com log, i learned a lot about this card just looking at the log). There we have it, Oberthur, Bit4id, AK910 usb token, now lets try opensc, ATR 3B FF 18 00 00 81 31 FE 45 00 6B 11 05 07 00 01 21 01 43 4E 53 10 31 80 4A. 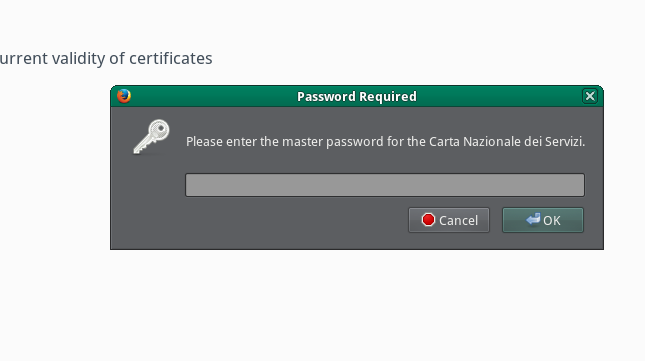 Logging in to “Carta Nazionale dei Servizi”. 0000010: e347 0212 44e2 8e12 d48e ba7a ec74 060e .G..D……z.t..
0000040: a641 1ba5 f633 8450 baeb 1233 1bb0 4d01 .A…3.P…3..M.
0000050: 1fdf 5cb5 c637 d23d 30ec 0a93 ef77 86c9 ..\..7.=0….w..
0000060: ae5f 4625 2cf4 cf09 2853 909e 2650 65e4 ._F%,…(S..&Pe. 00000b0: eab3 89f1 8299 ec4b f470 f713 39f1 4ee5 …….K.p..9.N. 00000d0: bf28 b774 68fb 76ae b448 ce7d daf7 2afe .(.th.v..H.}..*. 00000e0: d238 8e53 ae4b 285c be1a 39e3 f93f f0a5 .8.S.K(\..9..?.. 00000f0: 4790 5afc 4dac 0cb5 ec97 fc81 8128 8ca6 G.Z.M……..(..
voila, the signing process was a success, that means, the pkcs11 provided library works for this card, now you can configure your favorite app, so far im able to log in to sii.cl web with chromium and firefox, im able to do my taxes using only Linux. i hope this guide will help all chileans to make this hardware compatible and to ask our goverment for open tecnologies, with linux support, not nsa spyware from big corporations. 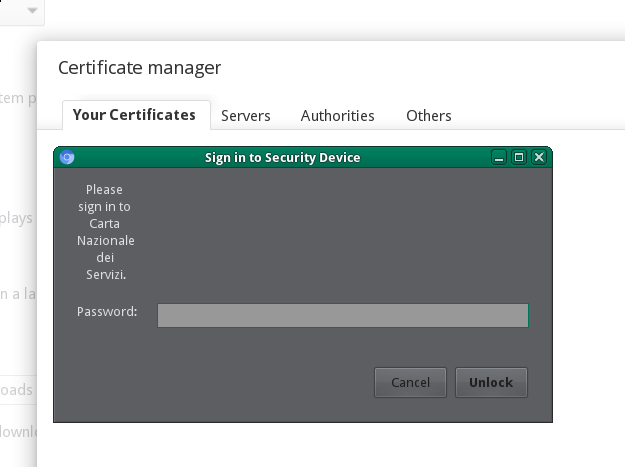 You can download it and use it with pkcs-tool, and finally we have our driver working, in firefox, chrome, PGP.